Powerful thermal recovery allows soldering at lower temperature settings. Lineup includes 85 types of standard soldering tips. Improve solderability and wettability with the HAKKO N2 system. 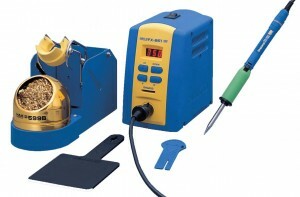 Requires a variety of equipment in addition to the N2 soldering iron. Click here for details. Specially designed handle and tip provide improved workability when mounting minute, high-density electronic components.